This book argues that the history and character of modern anthropology has been egregiously distorted to the detriment of this intellectual pursuit and academic discipline. The "critique of anthropology" is a product of the momentous and tormented events of the 1960s when students and some of their elders cried, "Trust no one over thirty!" The Marxist, postmodern, and postcolonial waves that followed took aim at anthropology and the result has been a serious loss of confidence; both the reputation and the practice of anthropology has suffered greatly. The time has come to move past this damaging discourse. Herbert S. Lewis chronicles these developments, and subjects the "critique" to a long overdue interrogation based on wide-ranging knowledge of the field and its history, as well as the application of common sense. The book questions discourses about anthropology and colonialism, anthropologists and history, the problem of "exoticizing'the Other,'" anthropologists and the Cold War, and more. 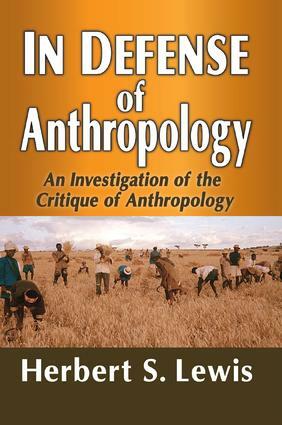 Written by a master of the profession, In Defense of Anthropology will require consideration by all anthropologists, historians, sociologists of science, and cultural theorists. 4 Was Anthropology the Child, the Tool, or the Handmaiden of Colonialism? 7 Franz Boas: Boon or Bane? 9 Anthropology or Cultural and Critical Theory?